Bookmakers and casino operators occasionally run special promotions that require a code to activate. These offers are usually only available to new customers and the bonus code must entered during the registration process. This section of the website aggregates codes from all available sources and displays them in a convenient table that can easily be sorted to find the biggest bonus or the largest deposit multiplier available. If you come across a code that isn't listed please let us know and we'll add it. 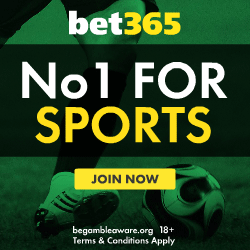 In my experience the best bonuses with the most straightforward terms can usually be found at Bet365, click here to learn more. Terms & Conditions apply, 18+, new customers only. Below is an up-to-date list of UK bookmakers that accept bonus codes when signing up as a new customer. Below is an up-to-date list of UK casino operators that accept bonus codes when signing up as a new customer. How Do I Withdraw The Bonus? Each offer comes with its own terms and conditions, be sure to read these carefully for a full description of the circumstances in which the bonus amount can be withdrawn. In general the deposit must be 'rolled over' a certain number of times before a withdrawal can be processed. For example when using a 100% deposit bonus with a rollover requirement of 3x, the amount of the initial deposit would need to be bet three times before a withdrawal could be made. Sports betting rollover requirements are typically much lower than casino bonuses. Are The Codes Up-To-Date And Valid? Codes are verified and added to the site immediately as we become aware of them. When bonus codes expire or stop working we update the site as quickly as possible. Please let us know if you notice anything that should be updated. How Do You Find The Bonus Codes? Third party websites and emails. Printed media such as newspapers and magazines. To help us keep the site running as a free service some bookmakers pay us a commission for referring customers when they click our links. We also enjoy helping our users find the best deals available and making clear the terms and conditions that some operators try to obscure.